Having set up several kayaks specifically for saltwater fishing purposes, I now ensure that any and all modifications I make are geared with two purposes in mind: safety and fish catching capability. 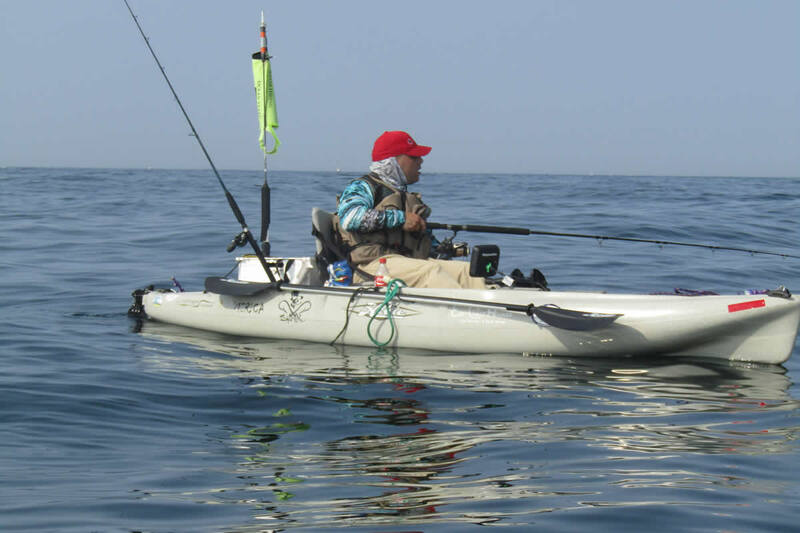 Most fishing kayaks, regardless of brand or intended target species, will likely have the same basic items added to them, rigged specific to the kayaker’s individual needs. A milk crate. The MacGyver of kayak fishing modifications, the milk crate is one of the most versatile and under-appreciated additions a kayak angler will likely add. Milk crates function well as organizational spaces, storage areas and secure mounts for accessories to include action cameras and additional rod holders. The milk crate will be the most inexpensive modification you add to your new kayak, just make sure you secure the crate and all items contained within in the event of capsizing. Flag Pole with lighting. Flag poles, preferable with affixed lighting, are the single most important addition to anyone considering rigging their first kayak. Consistently utilizing a kayak specific flag pole, preferably with nighttime lighting, ensures you remain visible to nearby boaters. I personally use and strongly recommend Yak Attack VISIpole II w/ 360-degree light ($75.00). Rod Holders. Rod holders will likely be the first modification done when rigging any new kayak. Unfortunately, choosing one of the various types of rod holders will come down to the individual kayaker’s preference and also will likely be swapped out or repositioned several times after rigging. Choosing the right rod holder style and mounting location will take into account fishing styles, body size, and weight of tackle. Acknowledging my personal fishing style which often favors trolling, Scotty Power Lock Rod Holders remain my preferred rod holder solutions during both trolling and drift fishing methods. Fish Finder. Although fish finders may not truly be a necessity when rigging your fishing kayak, having the capability of visually perceiving what is underneath you while fishing may be the difference between catching that personal best fish and coming home skunked. One of the most valuable fish finder lessons taught me that first year was that the fish finders true purpose wasn’t to see the fish under you, it was to visualize the structure and contour of the ocean floor. Learning to identify targeted fish species preferred locations and environments will make you a consistently better angler. Recent advances in fish finder technology have provided kayak fisherman with a plethora of wallet-friendly choices, often with GPS and chart plotting abilities included. If you are in the market for an entry level fish finder, I recommend both Lowrance Elite 4x and Raymarine Dragonfly 4. Leashes: Last, but not least, adding leashes to any fishing kayak often comes from the dreadful experience of losing expensive, non-floating and unsecured fishing tackle to Davey Jones Locker. If you are debating the necessity of including leashes during rigging processes, a simple internet search will uncover countless stories of kayak fisherman losing thousands of dollars’ worth of fishing equipment that would have likely been recoverable had they attached leashes. Disclaimer: I have on occasion, leashed myself to my kayak via 550 Paracord and carabiners in rough waters. Wilderness Systems Kayak Pro-Staff Member and Ocean State Kayak Fishing co-founder Tom Adams said, “I don’t think I could narrow it down to one thing… it ranges from rod holder placement and mounting to fish finder location for ease of access and still being out of the way when needing to paddle; then there’s the safety flag/light placement and my newly added reentry/rescue rope.” In summary, the list detailed above should provide a starting reference point for those planning their first kayak rigging session. For specific questions regarding rigging, product reviews or overall advice, experienced local kayak anglers, as well as organized kayak fishing groups on social media platforms remain the best kayak angler resource.